A no-deal Brexit plan in which one side of a motorway was reserved for lorries is to be removed after Britain's departure from the EU was delayed. Operation Brock, intended to tackle queues created by delays at the border, had been in place since 25 March. One side of the M20 was used only by HGVs heading to Dover, with all other traffic restricted to a contraflow system on the opposite carriageway. Highways England said work would begin overnight to "deactivate" the system. The UK's departure from the EU had been set for 29 March, but has now been extended until 31 October. Coast-bound traffic will return to three lanes at 70mph, while London-bound traffic will continue to be restricted to two lanes at 50mph, Highways England said. A steel barrier, which created the contraflow system on the London-bound carriageway, will remain in place. 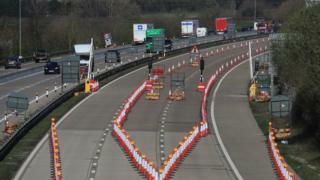 Highways England said sections of the M20 between junctions 10 and seven would be closed overnight while work was completed "in time for the Easter getaway". Under plans for Operation Brock, hauliers would have also been sent to a lorry park at Manston Airport - and the M26 could have been be closed and used for queuing HGVs in the event of severe disruption. Ashford MP Damian Green had called for Operation Brock to be removed. "There is simply no need to have it there and it causes inconvenience," he said. "A lot of people have complained that the road is much less safe, because it is narrower and there are concrete barriers on it." Duncan Smith, of Highways England, said: "The deployment of the contraflow on the M20 has been a prudent measure reflecting the threat of potential disruption. "Scaling it back now is a sensible response to the changing outlook, and restores capacity on the motorway in time for the Easter bank holiday weekend."